Sara Seager talks to New Scientist magazine about the giant library of "weird chemicals" she is creating to use in the search for exoplanetary life. I’M WITNESSING the future of the search for alien life. In a dimly lit office on the 17th floor of MIT’s tallest building, with shades drawn over the Charles river below, Sara Seager and six other researchers are showing me the foundation stones of a vast library of molecules – a few of which may be the first to alert us to the presence of life on another world. Seager and her colleagues are building a cache of biosignatures – chemicals that would suggest an alien planet is playing host to life. Seager is casting her net as wide as possible. Because we can’t predict what the biochemistry and ecology of alien planets will be like, she’s looking at all small molecules, not just the ones linked to life as we know it. Finding such signals is no pipe dream. Two upcoming NASA missions – the Transiting Exoplanet Survey Satellite (TESS), slated for launch in 2017, and the James Webb Space Telescope, scheduled for 2018 – will work together to catch starlight filtering through a handful of exoplanet atmospheres. Later missions may allow us to see dozens more. Written in that starlight will be unique signatures of the molecules those atmospheres contain, some of which may be produced by life. The question is, how will we know? Seager is perhaps the ideal person to ask. She started her career by modelling the atmospheres of gas giants around other stars – long before exoplanets were a hot field of research. So she is used to working blind and waiting years to check her models against real data. But her spectral database is joining a crowded field. 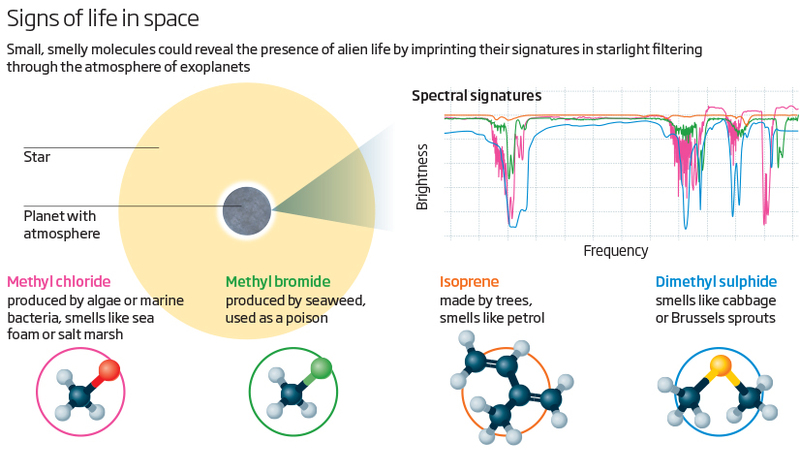 Astrobiologists have generally focused their attention on a few key molecules that might show up in an alien atmosphere as signs of life, and spent their time planning how to interpret them. To that end, Meadows’s team at VPL is simulating exoplanet atmospheres containing biosignature gases to predict the best candidates for sniffing out life. And a team at Cornell University’s Carl Sagan Institute is collecting spectra from algae and other organisms that might resemble the vegetation growing on an alien planet. Take oxygen. It may be life’s most famous gas, but Seager questions its role as a good biosignature. It can be produced by geological activity, she says, and even life on Earth hasn’t always made enough of it to be detectable from space. Methane alone would be suggestive, says Bains, but geologists might be able to explain it away as well. So Seager and her team are starting with basic chemistry to expand the realm of possible biosignatures. Seager, Bains and Janusz Petkowski of the Swiss Federal Institute of Technology, Zurich, have created a list of every chemical with a backbone of six or fewer atoms by linking together elements like carbon, phosphorus, nitrogen, oxygen, sulphur and hydrogen – the most abundant elements of life. They narrowed the list down to molecules that exist as gases, and are reasonably stable over time. Seager suspected that life on Earth could make every single gas, although that hunch was only partially borne out in a thorough study of gases with known links to life. But the various chemical footprints of terrestrial creatures are so wild and weird that her team thinks all of these small molecules should stay in play in the search for life elsewhere. Seager and Bains lump their possible biosignatures into three categories (arxiv.org/abs/1309.6014). There are gases released when organisms exploit chemical gradients for energy, like methane, and inputs and outputs in the chemical pathways creatures use to build biomass, like carbon dioxide and oxygen. Then there’s everything else – all the scents, perfumes, poisons, and other concoctions of life. Gases in the third category may be ideal biosignatures. Terrestrial life makes smaller amounts of them, but they are probably less likely to be mimicked by geological processes. One example is methyl chloride, a toxin produced in large amounts by marine bacteria – or methyl bromide, another toxic chemical seaweeds employ in interspecies warfare (see diagram). Meadows had suggested earlier that methyl chloride could build up to detectable levels in the atmospheres of exoplanets, far beyond what we see on Earth. Other pungent gases include dimethyl sulphide, part of the scent of cooked cabbage; isoprene, a gas trees make to resist heat stress that smells a bit like petrol; and methanethiol, familiar from bad breath and flatulence. Observations of a single biosignature gas will never be enough to discern its true origin. But the hope is that an ensemble of molecules on a single world or across several worlds might make a stronger case for alien life. “If you had methane and methyl chloride and dimethyl sulphide in the atmosphere, trying to explain all that from geochemistry is just staggeringly difficult,” Bains says. Armed with the list, Seager’s team has spent the last three months hunting down spectra for several thousand of these small molecules – which hasn’t been easy. A few hundred are available in chemical company databases and digitised reference books from the 1960s and 1970s, but most remain missing. Other spectra will be modelled in computer simulations or measured by hand. Once it’s finished, Seager plans to incorporate the library of spectra into simulations of exoplanet atmospheres to make sense of the first evocative whiffs of alien chemistry. Other efforts, for their part, will probably prove complementary. Meadows’s VPL group is cataloguing the ways oxygen could be made on a lifeless world to help rule out false positives (Astrobiology, DOI: 10.1089/ast.2014.1231). “I think the key science is going to be in not so much broadening our outlook but in trying to focus in on the gases that are most likely to be there,” she says. Whatever signals telescopes pick up, there’s sure to be debate about what they mean – and if the aliens are still there at all (see “Alien apocalypse“). For now, Seager thinks the work harks back to her time on the unexplored frontier, when she was modelling giant exoplanet atmospheres.